The Taoiseach is set to turn on the lights next week. TAOISEACH ENDA KENNY has been told he should not show up to turn on the Christmas lights in the north inner city of Dublin this year. The Taoiseach has been scheduled as the guest of honour next week, a position usually filled by a well-known member of the community. This decision has caused anger among many locals who say Kenny and “his false promises” shouldn’t be given any recognition. 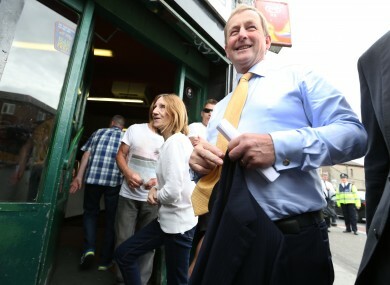 Anthony Flynn, director of Inner City Helping Homeless (ICHH) said Kenny’s appearance should be seen for what it is – a political stunt designed to promote the idea that Kenny cares about the inner city. Flynn believes this could not be further from the truth, describing Kenny’s talk as “just soundbites”. While there has been critics of the plan, there have been those who’ve welcomed the Taoiseach’s approach. City councillor Nial Ring said he has no problem with Kenny coming down as he “has shown a great commitment to the north inner city in recent months”. He said: “I’ve no problem with it at all. He’s been down here four or five times this year. He has shown great commitment to the inner city in ecent months and that’s good enough for me. Now I’d prefer if Bertie would come down and do it but we’ll have to wait and see if he comes back first. Speaking to TheJournal.ie, homeless activist Flynn said he doesn’t understand why “the red carpet is being rolled out”. Flynn described how there is a lot of anger and opposition to Kenny’s scheduled appearance but many will welcome him as their organisations have something to gain from “massaging his ego”. Flynn added: “Usually, the person who lit the tree would be someone from the community. The tree is in remembrance of people who died from drugs. He’s done nothing to address that problem . There’s been an awful lot of talk and absolutely no action. I think he shouldn’t turn up. He’s not welcome, in my opinion. I’ve been speaking to a lot of people in the area who feel the exact same way. The Taoiseach has been seen on a number of occasions in recent months in areas of the city which have been hit by gangland violence. Last month, Kenny visited a shut down garda station on Fitzgibbon Street in the inner-city and met with Chief Superintendent Pat Leahy. The Government intends on reopening the station which is located in the heart of the city. There is also another inner city task force meeting tonight and the report is being finalised by Kieran Mulvey. Email “'You're not welcome': Mixed reaction ahead of Taoiseach's visit for inner city Christmas ceremony ”. Feedback on “'You're not welcome': Mixed reaction ahead of Taoiseach's visit for inner city Christmas ceremony ”.